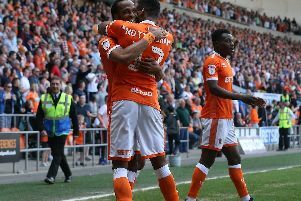 Blackpool have cut the gap in the League One play-off race – and goalscorer Matty Virtue says it was long overdue. The 21-year-old midfielder was among the goals as the Seasiders thrashed Gary Bowyer’s rock-bottom Bradford City 4-1 at Valley Parade on Saturday. The win, only Pool’s second in nine League One outings, restored them to eighth place and just two points behind Peterborough United in the last play-off spot. Virtue said: “It’s about time we cut the gap. We’ve needed to give ourselves that opportunity after the last few games. Teams have been slipping up lately and we’ve been thinking, ‘What an opportunity we’ve missed’. So to go and win when a couple of other teams have lost is massive for us. “There’s always been belief in the squad, even when we got beat 3-0 at Burton (seven days earlier) because we know we’re better than that. If we put a few wins together we can really push for that sixth place. Pool netted four goals for the first time this season last weekend as Armand Gnanduillet netted a brace and Chris Taylor was also on target. Only five teams in the division have scored fewer goals than the Seasiders’ 43, though this latest result gave a healthy boost to their goal difference. Former Liverpool Under-23 man Virtue added: “We’ve been struggling for goals recently, so we’re very happy to put four in the back of the net, especially away from home. Virtue bagged his second goal for the club in clinical fashion, surging through the centre of the pitch before unleashing an unstoppable drive into the bottom corner from 25 yards. He recalled: “Jay (Spearing) won it back and we broke. The defender opened it up and allowed me to shoot, so I thought, ‘Why not?’ I caught it well and the next second it’s in the back of the net. “It was massively important to get that second goal. I thought we could have got a second in the first half and we’ve been struggling to kill teams off, but we managed to get it. “After that we concede the penalty but Chris (Mafoumbi) pulls off a brilliant save. I think the crowd would have got behind them if they had got one back and it would have been difficult for us, but we rode that spell.